A lovely holiday home in the countryside. 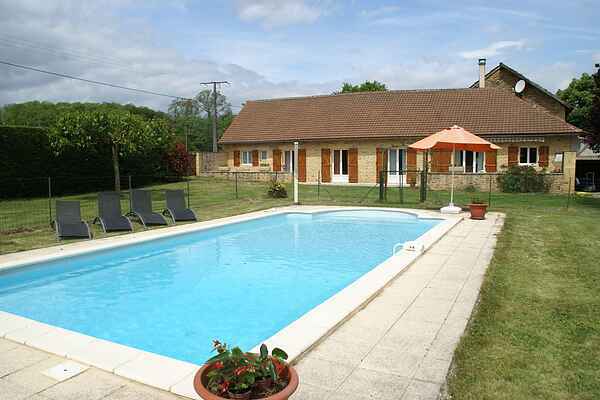 Situated just outside the town of Besse (3 km). This ancient city has a lot to offer holidaymakers. The house includes a private swimming pool, an enclosed garden with a rocking chair, table tennis and plenty of room for the children to play. All the bedrooms have French doors leading to the terrace and garden. In the morning, you can walk straight to the pool and start your day with a refreshing dip. Besse is a beautiful town, draped in a golden yellow glow due to the typical Périgord bricks in its architecture. Even the stone roof of the magnificent 12th century church is original, giving it a unique character. In the immediate vicinity are several lakes near Prats-du-Périgord (6 km), Cazals (10 km) and Frayssinet (16 km). Enjoy a nice stroll in the surrounding woods. The people of Bresse depend on wood processing for their livelihood. Golf enthusiasts can play outside of Belvès and in picturesque Domme (24 km). Cahors (50 km) is an ideal destination for a nice day trip. In the surrounding area, plenty of wine is produced. The landmark and symbol of the city is the magnificent Valentré Bridge.